My sister and I live more than 500 miles apart and we only get to see each other 2 or 3 times a year. There is seriously not much telling what we will get into when we do finally get together and our husbands simply have to be prepared for whatever scheme we devise. She recently came to visit me for a week. We ate out every night and zipped around town all day. We even spent one afternoon in the beauty shop together and both came out sporting a fresh cut and color. She looked quite beautiful. Our mom even commented that evening that my sisters’ new hairstyle took years off of her appearance. Personally, I think it was more the “child” in both of us that appears when we are together. We had a lot of fun all week long, but my favorite memory of our week together was when we decided we would make a Pineapple Upside-Down Cake. Neither of us had made one in at least 20 years and neither of us had a recipe, so we called Mom, who graciously shared her “mental” recipe for Pineapple Upside Down Cake. We didn’t have exactly the ingredients that our Mom’s recipe required, so we did my favorite thing to do in the kitchen. We played! Oh, it is important to note, we did not want to go to the grocery store, so we used what I had on hand. Last but by no means least, my grandmother-in-laws old cast iron skillet. Cool for 15 min. and dump the cake from the skillet onto a large plate. Thanks to our generous portion of butter in the skillet, that cake turned right out perfectly onto the plate and it didn’t break apart! In spite of using a cake mix, concrete hard brown sugar, pineapple chunks instead of fresh sliced pineapple rings and “aged” maraschino cherries, this may well have been the best Pineapple Upside Down Cake I have ever eaten. Most likely due to the special ingredients of love and fun! Will we make it again? Most definitely and exactly the same way!!! Oh, my goodness, you and your sister sound just like what my sister and I do when we get together. Recipes that come from great fun and shared experiences are the best. I’m not sure I have 3 years out of date cherries, but the rest I think I can easily handle to make this delicious pineapple upside down cake! It has been years since I’ve made upside-down cake! I prefer peaches for mine. This does bring back sweet memories. How fun! I love cast-iron cakes and the variety of flavors you can make! Love the story behind the recipe! 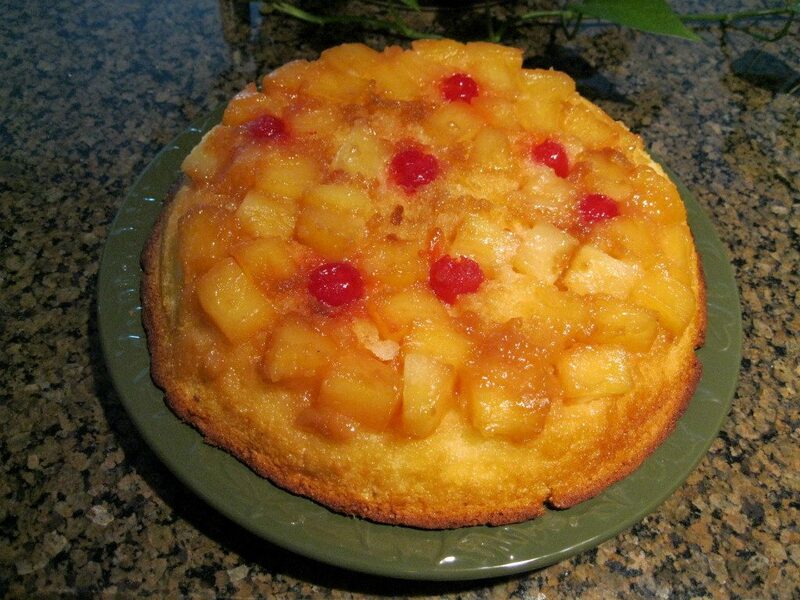 Pineapple upside down cake is one of my favorites. Now that I have an iron skillet, I need to make one. Your mother’s recipe-from-memory is just like what I remember my mother making many, many years ago when I was a child. This sounds wonderful, and so does your most recent visit with your sister! I didn’t inherit a cast iron skillet from my grandmother, unfortunately, but I have been diligently using and re=seasoning the Lodge cast iron skillet I bought a couple of years ago, and by now its surface is just about perfect. 🙂 Looking forward to trying this recipe someday (when we finally are able to replace our defunct oven! ).